Need a party dress? There’s an app for that! Okay, okay… I know that’s pretty dorky, but seriously… you should check out this great new app called Poshmark! 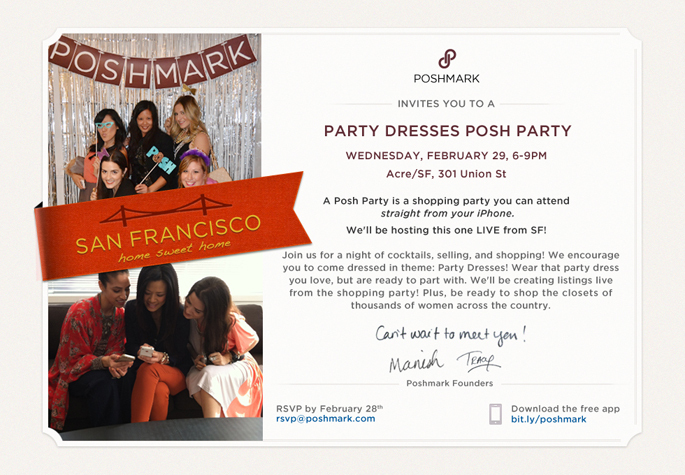 They’re hosting a live Posh Party on Wednesday (the 29th) in San Francisco and yours truly will be there mingling and shopping for party dresses with the Bay Area’s most stylish gals. If you are in the Bay Area I would love to see you there (don’t be shy), but if you’re not a local don’t worry! You can actually join the party straight from your iPhone via the Poshmark app (download it here). I’ll be listing a couple of dresses tomorrow during the event so I hope you can make it! Can’t wait to see your listings and can’t wait to see YOU tomorrow night!